Lipstick & Lollies is trying one of the favorite looks of the season - pink and red colorblocking. She made it her own with an edgy leather jacket! So cute! Urban Frill is channeling her inner 50s housewife for a sweet polka-dotted look with a modern twist! Pop over to see how you can recreate the vintage inspired look! 100 Inspirations shows us how to get Kourtney Kardashian's fun floral look! Stop by to see what pieces are used to recreate the look, all for under $95! Love your list! and your last post it's very nice! I follow you now, follow me? Haha, definitely checking out these links! Great It List! I love, love your Beatles tee! HUGE Beatles fan over here!! Have a wonderful weekend. Check out my Fab Friday Beauty Tip if you have some time! Love this! How fun and you look amazing! Loved that outfit! Thanks for the comment! I love these outfits! Such a great compilation!! I'm definitely going to check out these blogs, all these ladies look amazing! 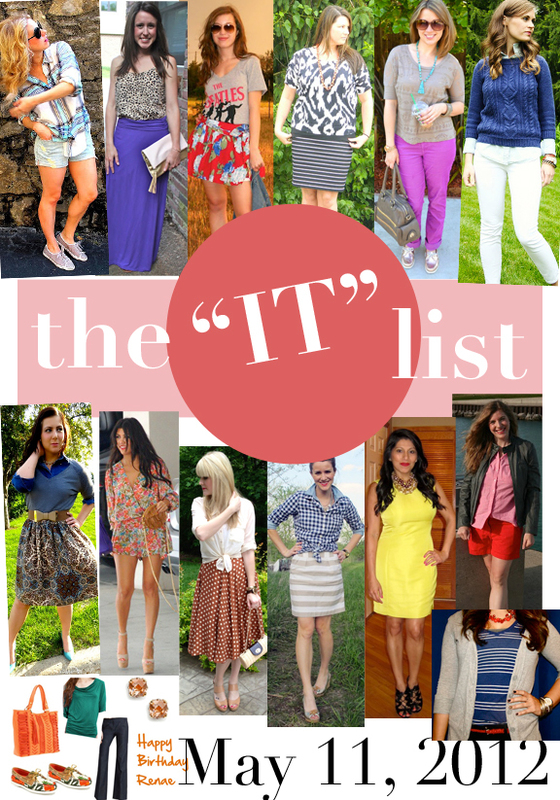 Lovely 'It List', a nice insight into different types of styles from all these fashionable ladies. So much inspiration! Thanks for this! I love that you do this! Very great idea! great idea, love all these! so much goodness, all wrapped up into one!!!! loving this post! and all of this style! Love getting introduced to new blogs from a blogger who I admire! Thanks! Love it! What an awesome mix up! This is a great list. It all looks fantastic!! You are doing an amazing work with your blog honey. I adore it!!! All these ladies look fabulous. This is a great idea to feature various bloggers! I love the idea of this post, such a good way to connect with other bloggers! Such a great idea! I think I'm going to take part of it. Thanks for sharing love!! Fabulous post! I love how you called it the IT LIST! WOW! So much to click, see and read!! Love all of these looks! So much inspiration for spring. Awesome! I love checking out new blogs, I'll definitely be stopping by these!